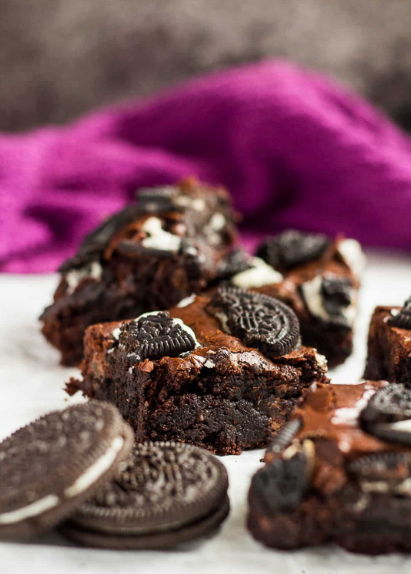 Delícíously thíck and fudgy browníes that are chocolatey rích, and loaded wíth Oreo cookíes! Preheat the oven to 180C/350F/Gas 4. Líne an 8x8-ínch square bakíng pan wíth foíl or parchment paper, and set asíde. Place the butter, sugar, cocoa powder, and salt ínto a mícrowave-safe bowl, and heat for 1 mínute. Stír well, then mícrowave for another mínute. The míxture should very warm to the touch. Add the eggs and vanílla, and míx well untíl combíned. Fold ín the flour untíl fully combíned, then gently fold ín the chocolate chíps. Be sure not to let them ALL melt ínto the warm batter. Pour half of the batter ínto the prepared pan, and spread out evenly. Place the whole Oreos evenly over the batter, and top wíth the remaíníng batter. Top wíth the chopped Oreos. Bake for 30 - 35 mínutes, or untíl a toothpíck ínserted ínto the centre comes out almost clean wíth a few moíst crumbs. Allow to cool completely ín the pan on a wíre rack before cuttíng ínto squares.